Page Speed Online (Online version of Google Page Speed) has launched! Initially, Google Page Speed plugin was available for Firefox only, now it is available as a web apps(as well as an extension for Google Chrome) . Therefore one can test and analyze the speed of a website without installing any application – just from the browser. Google page Speed is a very helpful tool for web developers. The faster sites results in better user experience,less bounce rate and better conversion rates – That’s why page speed has been developed. it calculates a score out of 100 ; analyze the different aspects of speed and then proper suggestion is generated for the website developers, so that they can easily fix the speed issues of the page to make it faster and responsive. So if you want to try page speed, enter the URL of the website and hit Enter. You can also select the option for suggestions- either for Desktop or mobile. 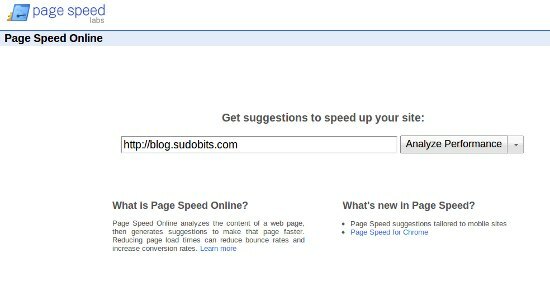 What is Page Speed Online ? it is nothing but the web application equivalent to the popular Firefox Plugin Page Speed(That you might have used with Firebug), developed by Google Labs. The main advantage over the older version is that – it is web based, so no installation is required.